A fire hose nozzle from the City of Orlando Fire Station No. 1, located at 19 North Main Street (present-day Magnolia Avenue) in Downtown Orlando, Florida. In 1883, after a dressmaking store in Orlando caught fire, William C. Sherman, a previous member of the Boston Fire Department, set up a volunteer fire force. Sherman served as its first Fire Chief and the organization also included Ben Bartlett, Tom Mann, J. Walter Hosier, J. W. Gettier, and Macy. The team used a hose, hose reel, bucket brigade, and a painter's ladder to extinguish fires. By 1885, due to the growing population, there were three volunteer fire groups, but they were consolidated into one under the name Orlando Hook and Ladder Company No. 1. The name Orlando Fire Department was adopted in 1890 and all other volunteer groups that had been created were incorporated into one group. 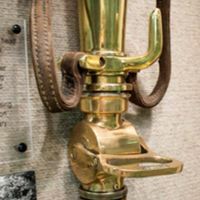 Original fire hose nozzle: Orlando Remembered Exhibit, Orlando Public Library, Orlando, Florida. Original color digital image by Rachel Williams, July 11, 2014. “City of Orlando Fire Station No. 1 Fire Hose Nozzle.” RICHES of Central Florida accessed April 22, 2019, https://richesmi.cah.ucf.edu/omeka/items/show/4102.